Quality product. As others, I wanted to use the XL650 powder check system and Mr bullet feeder so this was a great option. I bought this combo set for an Dillon XL 650 where I usually reload 45.ACP. Setup is very easy, but I reccomend the instruction movie on YouTube as a reference. I allready have a Mr. Bulletfeeder on my Dillon Super 1050 and the junior feeder works exactly like its big brother with the exception of the electric bullet feeding. However, "loading" the Bulletfeeder jr is quick and easy and I consider it a great product for any progressive press with enough stations to mount one. On my 650 I have a Dillon size and decapping die, powdermeasure, powder safety check, bullet feeder and the DAA seat and crimp die. The combo of the bulletfeeder jr. and DAA seat and crimp die is highly recommended. Using a Mr.Bulletfeeder while reloading is a real pleasure. It makes the reloading process faster and much easier. If you have never used one, you are missing out on one of the greatest reloading assists out there! A Bulletfeeder also improves safety, by preventing the need to insert your fingers under the tool head to place your bullets on the brass. Everyone should use one! 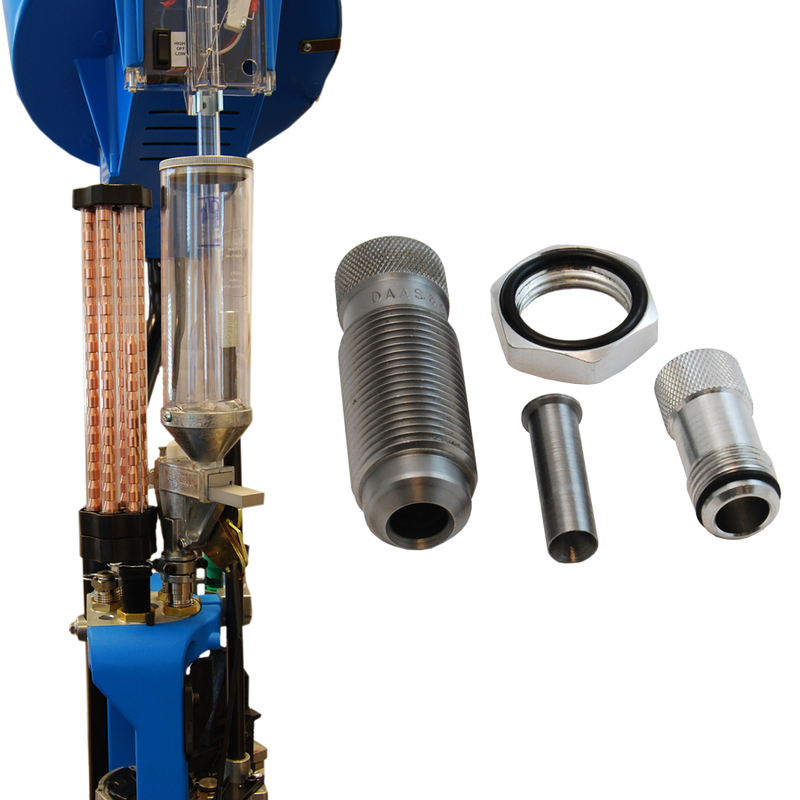 The Mini Mr.Bulletfeeder can be used on any progressive reloading machine which uses the same size dies as Dillon, however please note that the powder funnel we supply with the unit is designed to be used only in the Dillon powder drop! If you wish to use the Mini Mr.Bulletfeeder with another press, you may need to get another powder funnel to expand the brass. A common request we hear is “Can I used the Bullet Feeder on my 550?” Or “can I use the Bullet Feeder and still continue to use my powder check on my 650?”. The answer to both questions is, YES, provided you combine your Seating and Crimping operations into one station, to free up the station your Bullet Feeder will need. Such Seating and Crimping dies are available, and so we decided it was timer we made them directly available to our customers as well. We teamed up with one of the best Die manufacturers, LEE Precision, and are now pleased to offer you our DAA 2-in-1 Seating and crimping dies. These quality stainless steel dies, enable you to Seat and Crimp in one station, without compromising the quality of your ammo. It may take a little longer to get the adjustments just right, but once calibrated correctly, this die will produce consistent and precise quality ammunition. These dies include an O-ring lock machined into the nut, which allows you to hand tighten only – and the die stays put! They include a finger adjustable floating bullet Seater, are heat treated to ideal hardness and polished to the smoothest finish.